Pulse Electrical specialises in all your emergency exit light inspection needs. We conduct testing and reporting that meets all OHS and Fire Regulation requirements with our exit light inspection Brisbane service. If you are searching for a reliable emergency exit lights inspection company to efficiently handle your emergency light maintenance and comply with all coding and standards, you can trust us to be your one-stop shop. Our trained and certified crew provides exit light installation, inspection and maintenance. Give us a call today to schedule your exit light service! We are experts in exit light testing, maintenance and compliance. We set up an inspection schedule for you that helps to keep your exit light system both protected and operational while complying entirely with the legal requirements. Current legal requirements dictate you must conduct emergency exit light inspections and reports at six-month intervals to ensure that the fittings operate for the required duration of at least 90 minutes. As a business owner, it is your responsibility to ensure that your business is fully compliant with all codes and standards when it comes to your emergency exit lighting and emergency smoke alarms. -Before any testing begins, our qualified technicians will visually inspect all the fluorescent lights to check for darkening, which can indicate ageing or damage. And we’ll replace damaged units where necessary. – We then perform a discharge test for 90 minutes by simulating a power failure. Once your exit lights pass this test, they are then reset to their normal operating function. -We diligently record all testing results, repairs and replacements made and keep a copy of the inspection record on site. 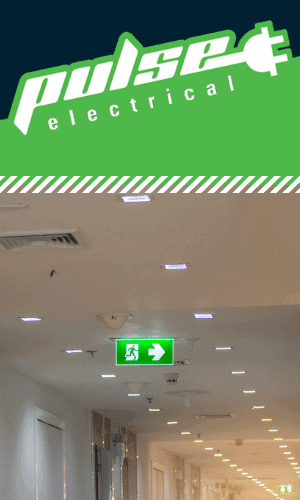 Exit Light Installation: Not only do we provide exit light inspections and maintenance in Brisbane, but we also offer professional installation. Our team of licensed technicians will properly install exit lighting for your business that is 100% compliant and up to date with coding and regulations. Whether you need new installations in a new building or need old exit signage replaced, hiring a professional and trained team to get the job done will ensure that your premise is both safe and compliant. The proper functioning of your exit lightening is vital, not only for compliance with coding but for the safety of your business, employees and customers. You need a team that is highly trained and qualified to carry out any installation, inspection and maintenance required to keep your exit lightening in proper working order. As a business owner, it is your responsibility to ensure that if your building experiences a power outage, there is a safe way for everyone to get out. Properly functioning exit lighting will help to ensure the safety of everyone inside. If your building is in need professional exit light inspections in Brisbane, give us a call today to schedule your service. We make maintaining your exit lights easy by setting up an inspection schedule that keeps you compliant and on time.